Schleich Realistic Therizinosaurus is museum quality replica, hand painted, authenticated model by the paleontologists of the Museum of Natural History. 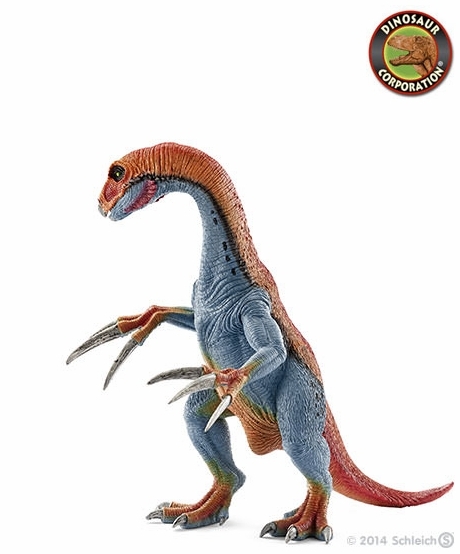 Therizinosaurus is a great toy gift for dinosaur enthusiasts and serious collectors. Therizinosaurus is a genus of very large theropod dinosaurs. They lived in the late Cretaceous Period (late Campanian-early Maastrichtian stages, around 70 million years ago), and was one of the last and largest representatives of its unique group, the Therizinosauria. The most impressive feature of the Therizinosaurus is its striking gigantic claws. Their purpose has not yet been revealed, however it is likely that it used the claws to defend itself. Since only a few skeletal fragments have been found so far, apart from the claws, one can only assume what the dinosaur actually looked like and what its feeding habits were.